ምርጫውን ለሚቃወሙትም፣ ለሚደግፉትም ቀጣዩ ጉዞ እንዴት ይሆናል? እንዴትስ መሆን አለበት? I think the requirement for this position was mainly ethnicity("being tigree").It is time to call the Ethiopian Orthodox Church as "the Tigrean Orthodox Church".History can be witness for the generation that no more unity in the church.Deje selam is responsible for playing bad game that damage the church this far.I ask u to stop giving wrong information by the name of the almighty of God.P/s stop working public relation work for this irresponsible,selfish,and one-sided pop Mathew. May God bless our loved country!!! May God give Aba Mathias all the needed strength and wisdom to lead our church in the right direction!! God bless Ethiopia!! As some write told us last time, the synode in the diaspora is also full of popes and supporters from Gonder only. There is no way to condemn Woyane for zeregnNet and support the run-away synode. Both of them are equally to be blamed. Now, lets focus on the future. 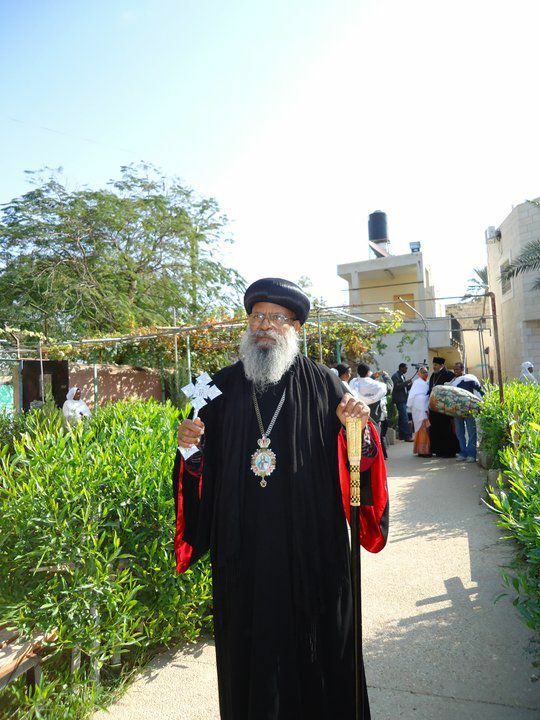 Still, the best solution is for Abune Merkorios to come back to Ethiopia and be in a place He wants. 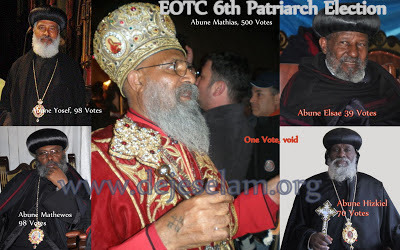 Then, the other popes can work together under Abune Matias. Otherwise, we EOTC followers have to say we don't know any synode outside of Ethiopia. It is non-sense to have an Ethiopian Synode in America. GOD KOWNS WHAT'S GOING HAPPING THE NEXT A FEW YEARS . Yes, indeed it is non sesense to have a pope who is no more an Ethiopian citizen.Think about he never leave in Ethiopia for last decades.Don't be ignorant,Gonder is a place of history and many more hero have been come form Gonder.Gonder mean Ethiopia.But,Tigree mean thieves and "Banda"
Abune Mathias kediaspora then yahl dimts yagegnalu biye asbe alakim neber. MIkniyatum lediaspora hulum neger lay mitayew weyane milew kal betiliku tetsifo newna. Engdi kager bet 500 + kediaspora... des ylal. Geta redtowachew betekrstianachinin and yemiyadergu abat yhunuln. Ene gegeta fekad wchi yemihon andach endelele amnalehu. Yhe kekedimo begeta hasab yenebere new. Menberu yemenfes kidus new. Kalefkadu likemetibet yemichil keto andach yelem. Esat newna. The TPLF spy master is now installed as 'patriarch' of our holy church by his own organization, not by the free will of Ethiopian Christians. TPLF will never allow any institution to be lead by other Ethiopians other than its own Tigreans. The church has been used as its fertile-ground for its spy network both at home and abroad to control and divide us. We know what Aba Matyas has been doing in diaspora for the last 30 years, both during TPLF's guerrilla warfare in the bush and after seized state power in 1991. He will continue serving his own organization by using the church for our division and infighting. TPLF will continue pleasuring our pain and suffering. This will be the mission of Aba Matyas the son of ''the golden race' as they call themselves. Yes the status quo will be there as it has been for the last 21 years as long as we, the rest of Ethiopians choose to stay divided and infighting each other instead of fighting the common enemy of ours. Our division is their strength and our 'neutral church' is their pleasure. This has been the reality so far. The big question is can we change this reality and stand together in our favor to change the status quo ? Let us pray to our mighty God to give us his Holy guidance into the right path that will take us into our promise land! Dear deje selam why is the two candidates place of birth not mentioned, while you stated the rest three candidates, are you kidding us or being wise.....you think you can hide their place of birth that we ever known! Egziabher Tewahedo haymanotachenen yetebek , ye `haymanot abat be card mereta egzio malet becha new wegenoch. I live abroad, and I found the news only in this, diretube, and ethiotube sites. I was wondering why others keep silent (or at least are late to report this news). I remember Dn. Daniel Kibret posting a kind of a follow-up report when the Egypt's Coptic Church was doing the same. Once I saw this news, it was his blog I visited next to read his post. None was there. And none has been said either in the Ethiomedias. My apology to come and comment here as I am not a believer, but I still care much about the church as it is the culture the church has given to me to develope my personality. I was following this process as much as I could, and I was hoping a flooding news all across the Ethiopian sites and blogs. Good luck to the future of the church, which has given us the wisdom, history and shape of Ethiopia. You guys please start looking forward. Let's talk how we could make sense out of this election. I don't want to hear 100% bad stuff about our fathers all the time. Who are we/you after all to say this father is good and that one is bad? God judges all and he has time for all. I can't see anything positive coming out of this site. I'm hoping I'm not gonna visit it again. Bored of all your" judgments" !!! If you guys have big heart, just pray but insulting our fathers doesn't help anyone. I want this site to be a " peace site" aims at supporting our churches both here and in Ethiopia. Let's all help both fathers and wait until God's time comes. Sorry if I offend you but I'm just not be able to see good things coming out of this site. Hope you'll start looking back your philosophies/approaches. We did not put Abune Mathias's birthplace because the article was not composed by Deje Selam. Please check the source. Lela Hasab Kaleh geen qetel. Yehe yemichal kalhone gin ebakihen betekirstianuan tewat - lemeemenu, lebetekirstianitum keadisu patriarch gar beaddis menfes Egziabheren tesfa kemadireg gar endiagelegilu edil setat -enji LELA TECHEMARI ESHOH LEMETIKEL MEDIKEM AYASFELEGIN - YALEW YEBEKATAL ebakih. ቆ... ቆሜ ካላሉት ገብቶ ይፈተፍታል!! በቃሌ ይቅርታና፤ ቤቤተ/ክ ዙሪያ ሳይሆን ምነዋ 'በቁጭራ' ሰፈር የተወለድን/ ያደግንም/ እያደግንም ሆንን? ተሰዶ ማስተዋል፤ ... ሁሉም ዜሮ? your pooling system is manipulated you fools. just delete your cache and cookies in your browser after you give your vote and then you can give so many vote as you like for one person. so you can manpulate your pooling system. i tried it myself. i could vote repeatdly. EGZIABHER AMLAKACHEN DEJESELAM WESITE YESEWEN HTIATENA DEKAM MEGLETSE AKUMO BEFEKERENA BENESEHA MIMELES ENDIHON AZEGAJOCHUN YERDALEN AMEN! AMEN! AMEN! PLEASE TALK PEACE, TEACH PEACE. ለምሳሌ አንድ ሰው ያለኝ ትዝ ይለኛል። እኔ የሰሜን ሰው ነኝ እኛጋ ብዙ ድንቅ ነገር አለ እናንተጋ ምን አለ? ያለኝን ላስታውሳቹ ፈልጌ ነው። የሚገርመው ይህ ሰው በጣም ጥሩ መንፈሳዊ ሰው ነው ውጫዊ ገጽታው ሳየው ።ነገር ግን ውስጡ እግዚአብሔር ይወቅ። ለዓለም ሞተናል ብላችሁ የአባ መቃርስን አስኬማ የለበሳችሁት ለምን ለስልጣን ትጓጓላችሁ? መሐራ እግዚኦ ሳትባሉ ተረስታችሁ ይሆን እንዴ? የቅዱስ ማርቆስ መንበር እናንተ ትቀልዱበት? አባ ማትያስስ መጨረሻቸው ምን ይሆን????? I am a regular reader of this Blog. I like most of the information post on the site. The post under “I told you so” – luck good judgment and objectivity. It seems to me that you have a particular agenda – rather than objective reporting. I commented on the subject, though it is not offensive in any measure of standard, you chose not to post it. I hope I will see this one posted. God bless Aba Mathias and let the Almighty give him the strength to lead and the courage to change to put the church in the right direction. Let God give us (the parishioners) the openness to see him as a monk who devoted his life to the Ethiopian Orthodox Church, not judge him based on the place his birth and ethnic background. I could send you a copy if you have trouble opening that video. Tigreans will never accept amara Pope, why you pathetic amaras don't rise together like the muslims are doing and form your own amara Pope. I'm sure Tigreans will be happy to have their own too in their language. I guess you people are morally dead due to the crimes you committed while in power otherwise you are not making any sense. How could you be ruled by people who are merely 5% of the Ethiopian population and cry endlessly for almost 3 decades now? ? ?